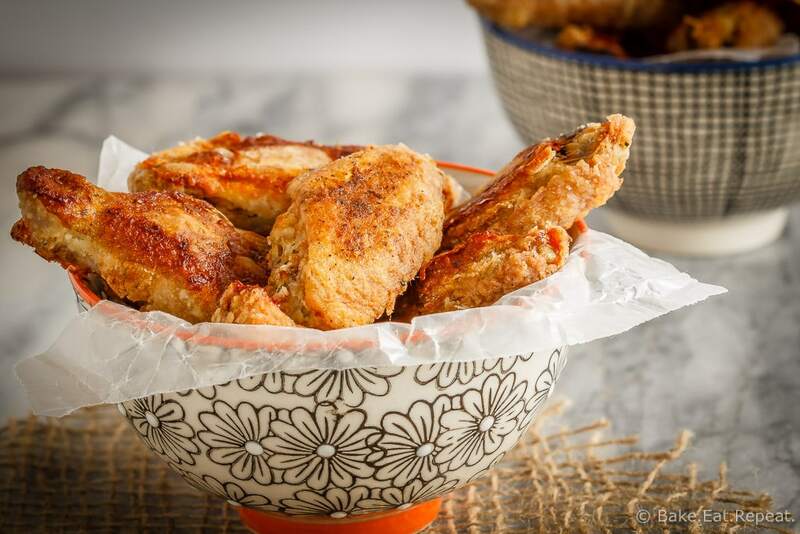 These oven baked wings are super crispy and so easy to make. Toss them with your favourite sauce for perfect wings that are baked instead of fried! Does anyone else ever have an appetizers only meal? We do this sometimes, generally on a Friday night, often when we have company. It’s a fun meal where everyone eats way too much, with far too much unhealthy food. So basically it’s the best kind of meal! It’s always a bonus when we can have those appetizer nights with our favourite treats – but made a bit healthier then the usual deep fried fare found at a restaurant. These crispy oven baked wings are one of our favourite appetizer treats. I almost always make them when we decide to enjoy one of these “appetizers for dinner” nights, and they never disappoint. We like ours tossed either in buffalo sauce or honey garlic sauce – spicy for the adults and sweet for the kids! Actually, I usually leave some completely sauce free as well because the kids enjoy them plain. 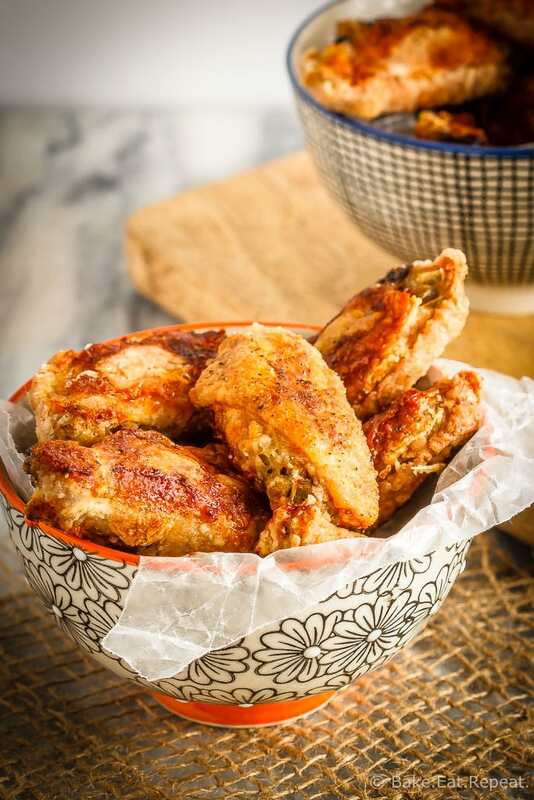 These crispy oven baked wings are so easy to make, and definitely a great snack that the whole family will enjoy. Baked to crispy perfection and then tossed in your favourite sauce, they will disappear quickly at your house too, I’m sure! Preheat the oven to 425 degrees F. Line a baking sheet with parchment paper and set aside. Toss the chicken wings/drumettes with the oil in a large bowl. In a small bowl, combine the flour, paprika, salt, pepper, onion powder and garlic powder. Add to the chicken and toss until evenly coated. Spray the parchment paper lightly with cooking spray. Place the wings on the parchment lined baking sheet, spreading them out as much as possible. You may need two baking sheets to allow a bit of space between the wings. Bake for 50 minutes, turning halfway through, or until golden brown and crispy. Toss the crispy, cooked wings with your favourite sauce and serve immediately. We like buffalo sauce or honey garlic. The wings will reheat well in the oven at 350 degrees F for 10-15 minutes. These are THE best wings ever! They beat anything baked or fried! We can hardly wait to try your wings recipe, Stacey - they look delicious. Yum! I always get appetizers as my meal, Stacey! They're much more exciting and delicious. Like this recipe! I can't wait to try it! I have actually never made homemade chicken wings -- is that crazy?! I need to try these! What?! 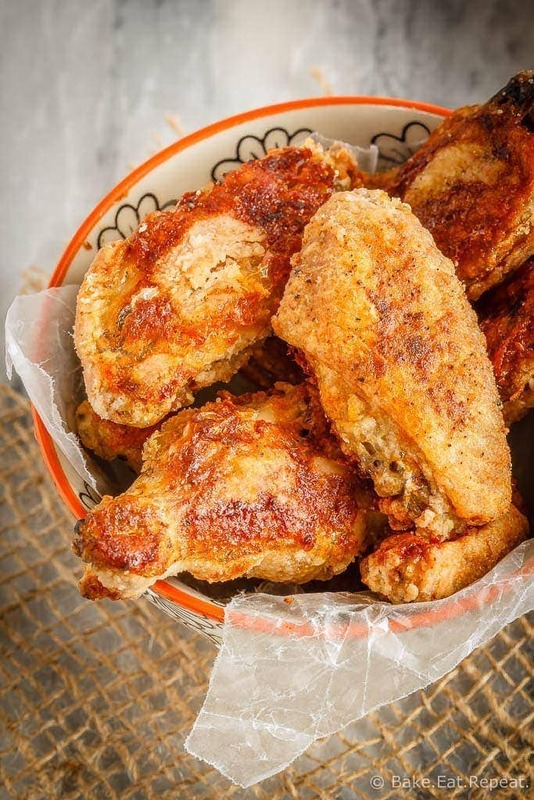 You definitely need to try making homemade chicken wings Ashley - so easy and so good! Thanks Christine! So much healthier when they're baked - we love these! Oh yes! Love these!! And I'm always looking for fun quick dinners (these days) as we're prepping for the holiday! Your pictures really have my mouth watering! Thanks for sharing! Appetizers for dinner are so much fun and we usually do that about once or twice a month. These wings look incredible! My husband is obsessed with wings and would devour them in no time - yum! We often have appetizers for dinner and these wings are just my "type of appetizer. I love that they are baked! Can't wait to try them! I love having appetizers for dinner! But you're right, I always eat too much! :) These baked wings sound fantastic, Stacey! I love how crispy these come out. And definitely healthier than fried ones! Sounds like the perfect Friday night dinner to me!